Few people would like to eat a whole lemon on its own. Yet every part of the fruit can be used in making a variety of dishes, savoury or sweet. Lemon zest can act as a natural fragrance to baking goodies. I made some lemon almond cookies the other day for afternoon tea, used the juice for drinks. These crunchy cookies with lemon fragrance tasted like heaven, yet not too sweet, and helped me refresh in this warm weather. 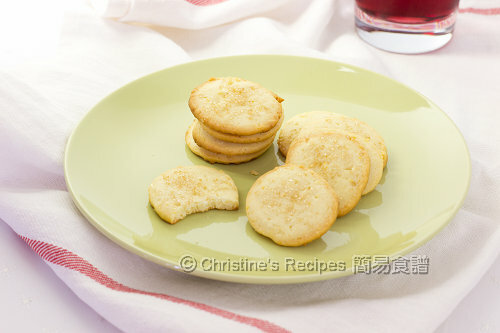 As Chinese New Year is around the corner, are you looking for ideas of making cookies for snacks or gifts. How about trying these lemon cookies? They won’t let you down. Use an electric mixer to beat the butter and caster sugar until creamy. Mix in the egg and beat until light and fluffy. Sift in the plain flour, cornflour, baking powder and salt. Stir in the lemon zest and almond. Just get all the ingredients combine until you get a ball of dough. Don't over knead though. Use a plastic film to help roll out the dough into a long tube shape, about 4 to 5cm in diameter. Wrap the dough and chill in fridge for at least 2 hours, or until firm. Remove the dough from fridge. Cut into thin pieces, about 1/2cm in thickness. Transfer to a lined baking tray. Sprinkle with demerara sugar and bake in preheated oven for about 12 to 15 minutes, until the edges are lightly brown. Transfer to a wire rack to cool completely. The cookies can be stored in an air-tight container or plastic bag for a few weeks. If the weather is too warm, you might feel the dough too soft or becomes oily while rolling out. Don’t panic. Simply refrigerate the dough until it’s firm and workable again. Or put it in your freezer to speed up the chilling process if you can’t wait too long. Cut the dough into 2 portions and work on one at a time. It’s much easier to handle the rolling part. Grease your knife in order to avoiding from sticking. It’s better to use unsalted butter because you can control the saltiness of the end products. If you don’t have any, you can use regular butter. 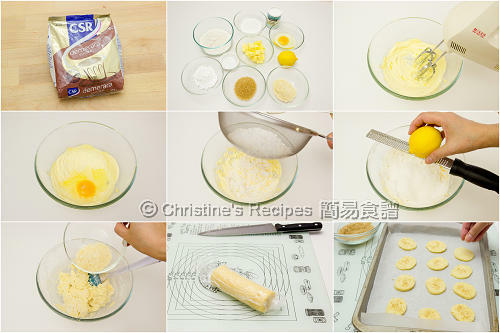 Christine, I love lemon and going to try this for CNY. Christine, what is demerara sugar? Here's an article with detialed info about demerara sugar. It might help. I would like to have a try too. I am from Vancouver. This is certainly a great treat for CNY! Looks amazing! Simple recipe but delicious! Greetings from Romania! Hi...can replace ground almond with ground hazelnut? Lemon cookies! I had never tried citrus cookies before. Thanks for sharing the recipe. I think it works for ground hazelnut or ground walnut too. Let me know how it goes if you make some. Thanks for sharing the recipe. Can make this for CNY! Oh great! 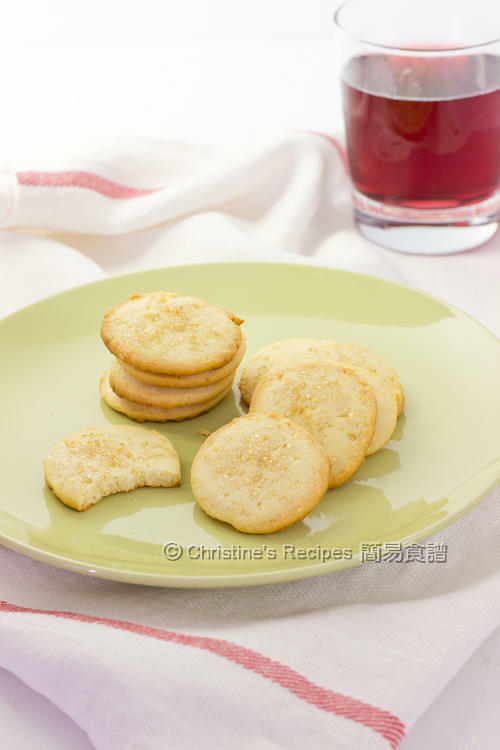 Adding lemon in almond cookies is such a great idea! Glad I saw your post in time! Christine, why use unsalted butter? Will it affect the taste if I use salted butter instead. There's no difference between using unsalted or regular butter. But you can have full control of the amount of salt used if using unsalted one. You can use regular butter (salted) to make the cookies. Just skip the salt in the recipe. Hi Christine, is almond flour the same as ground almonds? Perhaps it is more refined? Please check the ingredient labels on the packet of almond flour. If there's no other extras, just almond, you can use it for making these cookies. I bought salted butter, can it be used to make cookies? By using unsalted butter, you can fully control of the amount of salt added. But you can use regular salted butter, of course. Simply omit the salt in the recipe.